JBL Go: Palm Size Bluetooth Speakers Design By Harman: Bluetooth speakers are the necessary companion of our smartphones as we use this devices while on the go, while in home or any where you want to set your mood. There are many option in market for buying Bluetooth speakers and many brands to opt for so decision to choose “one in a million” is a tough job. 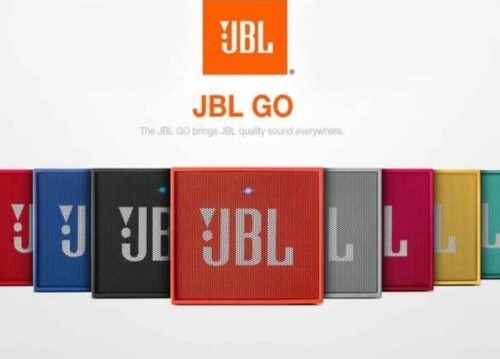 Today we are reviewing JBL Go which is the latest Harman’s series speakers from JBL. This product was announced at CES 2015 but still the best Micro sized Bluetooth speakers you can get. 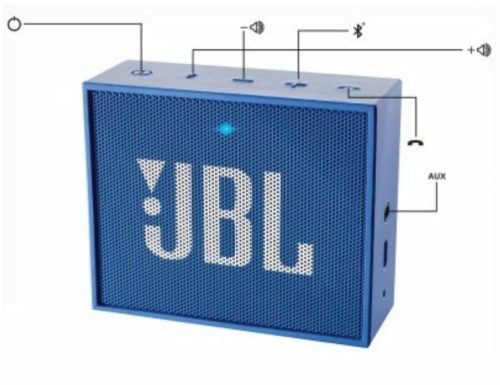 Even though you think this device is very low-cost which would compromise but that’s not the case for JBL as we reviewing this product we can across many surprising facts which we will discuss in our discussion so get let’s get started. First impression of this device really make us feel very compact experience with size which can fit in your palm fully and easy to travel along with it. Whole structure of device is very slim, light and color is awesome. Device comes in many color including Red,Blue,Black and much more you can see in the picture below. Harman has design this product for scratch with high quality material which they use in other products. Device is covered with rubberised tough plastic on the front side JBL GO has speakers grill where JBL is written as the color accent as the body. On the top of the device include buttons for power, volume up & down, Bluetooth and call. On the side device has 3.5mm headphone jack, Micro USB 2.0 Port and Microphone on the other side it has the gap for binding strip or band. As we see device dimensions 8.3 x 6.8 x 3.1 cm Bluetooth connectivity & enjoy the music. Compact in size & extremely lightweight. You can simply carry it in your pocket or handbag. While weigh around 130 g This compactly designed speaker is easy to carry, has a durable double-injection finish and it comes with an in-built strap hook that you can use to carry this speaker around easily. From its first impression and price we never think that this device performs so well in quality as listing audio in full volume don’t create any mess of sound or sounds disturbance which is nice to see in this type of device. Listening Pop, Hip-Hop, Rap Hip-Hop and more things are perfect as compared with price. Listening in medium volume with Indie really create much more interesting feeling. Bass of sound is also good enough for filling your room each and every corners.While playing songs for over 5 hour this device has little amount battery left which can be about 5 hour 30 min which is very nice for this small packet. While it is good for using in journey, listing in your room or small party as it is sufficient to vibrate our drums. Connector Type: Bluetooth, AUX-IN. Even if there is no Bluetooth on your phone, you can connect this speaker to your mobile device with an audio cable. Support: A2DP V1.2, AVRCP V1.4, HFP V1.6, HSP V1.2. Music playing time: up to 5 hours (varies by volume level and audio content). Additional Fatures :Simplicity of design in 8 vibrant colors and integrated carrying strap hook (strap optional). Compatible with all Bluetooth devices like smartphones and tablets. This is a Portable Wireless Speaker is smaller than your Palm. The Sound Clarity is good & can be used for hands-free calling as well. Costing of this device is approx for $29 form Amazon in any color choice you want. Connecting with any devices is very easy process and it’s just connect within a second that let you to boom. Resting device is very easy convenient process by just simply pressing the Bluetooth button for 2 second. While reviewing this device we have come across many experience as low-cost device are not always dump as using it for while surely takes your heart away with its looks and performance. While you can opt this device in too much color which JBL offers. While giving this device thumps up for purchase you why waiting just order your one.